Welfare Minister demands PM explain why the number of houses being built is far lower than the number of houses approved. Welfare and Social Services Minister Haim Katz (Likud) called on Prime Minister Binyamin Netanyahu to explain the gap between the number of housing units submitted for approval by the Supreme Planning Council and the much smaller number of units actually being built in Judea and Samaria. Minister Katz submitted his question during a meeting of the Prime Minister and Likud ministers Sunday. 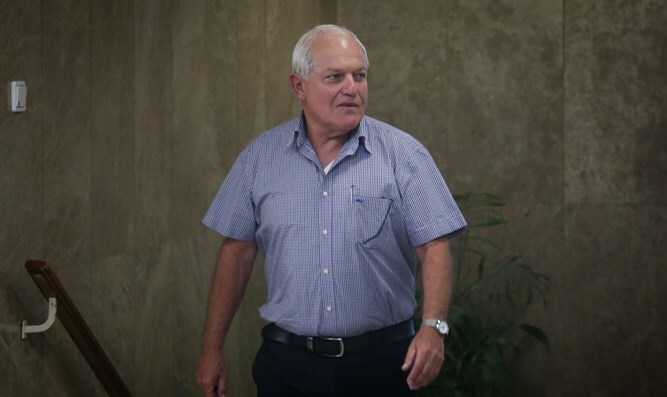 "I raised the issue of construction in Samaria at the meeting with our ministers - both the construction of residential units, and the paving of bypass roads and the construction of industrial zones," Katz told Arutz Sheva. "The time has come to build bypass roads, to prevent murder on the roads and to provide security on the roads. [The time has also come] to build industrial plants that foster coexistence and bring people closer together, and to expand the Jewish communities there because the demand and growth in Judea and Samaria, to our delight, is 10% per year," he said. The minister also addressed the fact that many elderly people live below the poverty line. "In the last poverty report, I found out that about 190,000 senior citizens live below the poverty line. I also discovered that the cost to rectify this is NIS 700 million ($200 million). During this session, I decided to promote legislation to bring all senior citizens in Israel above the poverty line - and tie the [National Insurance] allowances they receive to the average wage in the Israeli economy." "What about the disabled? There was a solution, but it was not acceptable to everyone," the minister was asked. "Recently, agreements have been reached on raising the disability pension," he answered. "Unfortunately, not all disabled people agreed to it. At the same time, I turned to the Prime Minister. As the person who should legislate the allowances law together with the National Insurance Institute, I asked for the [relevant] data. I pledge that when I submit the bill for legislation, it will solve the issue for the entire disabled community. I hope that it is passed into law quickly and that the disabled do not feel they have to strike again."